This advanced wire tap detector is the only one that will let you check both single and two line phones quickly and easily. It will check your phone lines for on premises series and parallel bugs and wire taps. Developed by a professional electronics TSCM developer to the specifications of counter-surveillance experts, the TT-46 is the best way to find out if someone is listening in on your phone conversations. The TT-46 is the only test set that lets you quickly and easily check both single and multi-line phone systems for series and parallel taps. This advanced unit tests every possible combination of wires in a four-wire cable; this lets you detect some of the more sophisticated taps that use split pairs. While not much can be done about down-line taps, the TT-46 will help you check your phone lines for on-premise series and parallel bugs and wiretaps. You can also check your telephone for the most common types of hookswitch bypasses. 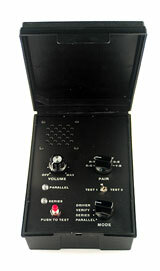 A hookswitch bypass is a modification to the telephone that causes the transmitter or receiver in the phone handset to pick up room sounds and pass them down the phone line even with the phone hung up, effectively turning the telephone into a room monitor.